Us Conductors garnered its author $100,000 when the debut novel won the 2014 Giller Prize. One of my personal goals is to read as many Giller-nominated books each year as I can manage. I’m not usually that successful in completing the goal, but I do manage to get through my share of some great Can-Lit selections. Sean Michaels’ novel definitely bumped closer on my radar when it won Canada’s richest literary prize but it was already in range when I heard the theremin’s inventor was the subject. 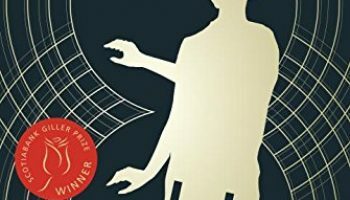 Us Conductors is a fictional re-telling of the life and work of Lev Termen, the inventor of the theremin musical instrument and many other modern technologies. The narrative focuses on his time in America promoting and securing patents for his theremin, as well as his time spent in Soviet prisons during WWII. The other main thread running through the novel, one that informs the narrative style, is Termen’s love for violinist and theremin player Clara Rockmore. The fictional Termen narrates through letters and interior monologues addressed to his absent “love-of-his-life” Clara. This means that many passages fall into the second-person POV. Which is a very difficult way to write without drawing the reader’s attention away from the narrative. While I was reading I was torn in my assessment of the success of the writing style. Both the aforementioned second-person POV and the heavy, annoying use of comma splices drew me out of the narrative flow. However, at close of the final page, I will give to Sean Michaels that he created a successful and daring novel. One that uses a tricky writing style appropriately and effectively. Nothing is more annoying that a senselessly difficult writing style for no apparent reason. You may get a sense of my reserve in heaping praise on the novel. While I’m willing to applaud Sean Michaels achievement and understand his prize win, I cannot wholeheartedly say I enjoyed the novel. For me, it comes down to the focus on the relationship between Clara and Lev–or should I say lack of relationship? OK, they met and had a fun time in the Roaring Twenties New York. OK, she was a teenager to his thirties. But I don’t buy the rest of Termen’s supposed mooning around for decades. The actions of the real Termen’s biography belie all this mooning about. It seems that Michaels is straining to fit this ill-fated love story into a mould that just doesn’t quite fit. I just was more excited about everything else in the story–the spying, the secret assignations, the inventions, the other theremin players, the Russian prisons–than I was about boring Clara. Read this book for its intrigue and for the theremin. I’ll give this 3.5/5 stars.